I don’t make coconut or coconut milk based Indian curries as often as I make the ones based on yogurt or tomatoes. It wasn’t until recently that I began experimenting with coconut curries, in large part, because my gallbladder seems to tolerate the fat in coconut milk more than it does the fat in dairy products. And what is strange is this: I adore coconut. When I was a child, a couple of times a year, I would talk my Mom into buying fresh coconuts for me when we saw them in the store so we could crack them open and I could drink the water from inside them and eat the delicious, nut-like meat. I loved any sweet with coconut in it, and when I first tasted Thai food in a good restaurant, it was the coconut curries that beguiled me and drew me into appreciation for the cuisine. So, why have I basically ignored Indian coconut curries for so long? Habit, I guess. That is sad to say, but I think it is true. But, no more. Having discovered I can basically eat coconut milk with relative impunity (my gallbladder has become quite annoying as I wait to have my surgery–it was scheduled for tomorrow, but has been pushed back to next week because my surgeon in the hospital this week), I believe I will be returning to it as a curry sauce base for years to come. I also used tamarind concentrate instead of the actual fruit as the souring agent in the curry because it is what I had. But the rest of the curry–the spicing and most of the techniques for putting it together are the same. I did use a few more curry leaves than were called for in Panjabi’s version, because I really love the flavor and aroma they impart, particularly in coconut-based curries. And instead of chicken pieces on the bone, I used boneless skinless breasts cut into chunks, because they are lower in fat and they were what I had in the freezer. 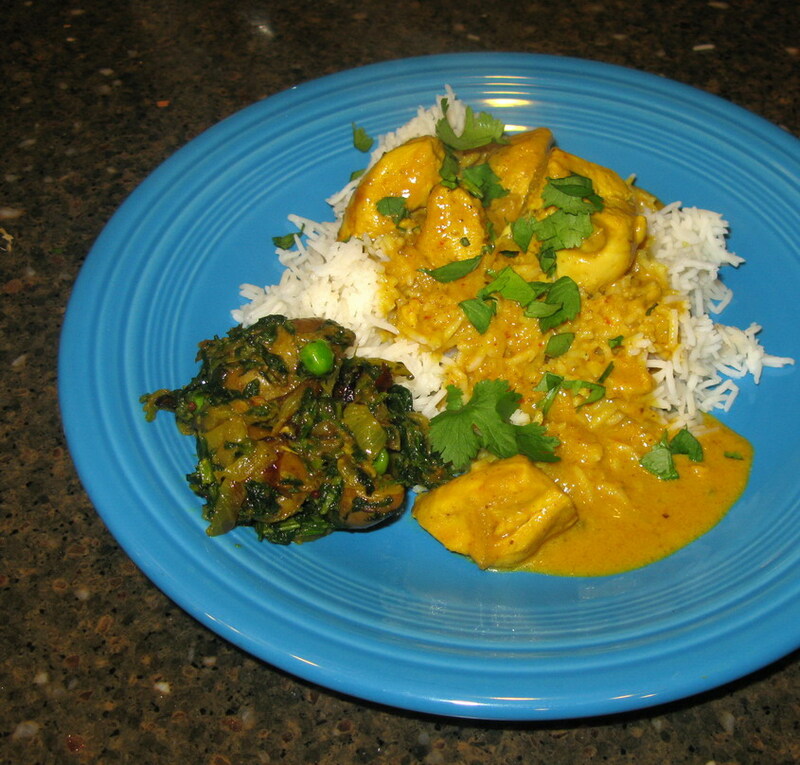 While I am certain that the original recipe as written was even tastier than the version I made, I have to say that this was one of the most fragrant, intensely flavored chicken curries I have had in a long time. I loved the spice mixture and the strong chili flavor was amazing, though balanced by the tang of the tamarind and the musky, pervasive scent of the curry leaves. It also makes a great deal of sauce which is very good poured over rice–in fact, I had some of the curry sauce, sans chicken, draped gracefully over a bowl of basmati rice for lunch this afternoon, and it was very satisfying. Not too filling, but definitely delicious, with a complex bouquet of flavors. In a small, dry skillet, toast the chilies, stirring constantly for about three minutes. Add the whole spices and the turmeric, and continue stirring and toasting for about another two minutes. Dump the spices on a plate to cool. When they are cool, put them into a spice grinder, blender or mixie, along with the Aleppo pepper flakes, chopped onions, ginger, garlic, turmeric and paprika, and blend to a smooth paste. Heat the coconut or canola oil in a heavy-bottomed wide skillet, and add the 1 1/2 cups sliced onions. Spread out the onions, sprinkle with salt and cook, stirring constantly until the onions turn a deep golden brown. Add the spice paste and stir well, then add the chicken pieces, and cook, stirring until the pieces begin to brown a bit and spice paste sticks to the pan, browning. Stir in the coconut milk (reserve the extra half can in case you want more sauce or you want to dilute it a bit–when you are done, however, you can keep it in a closed container in the fridge for a week, or in the freezer for several months), scraping up the browned bits on the bottom of the pan, making sure to get it all up and mixed in–this is what makes the curry taste so very good. Add the curry leaves and stir them in well, cover the pot loosely (let a bit of steam escape, in other words), turn heat down to low and simmer until chicken is tender. Salt to taste and stir in or sprinkle the cilantro over the top for garnish. I love 50 Great Curries of India so much. It isn’t as comprehensive as the big Madhur Jaffrey books, especially when it comes to vegetable curries, but it has an excellent keeper/chucker ratio, especially for such a small cookbook. My copy of 50 Great curries has a bunch of typos/errors that always bug me (ingredients listed but left out of recipe or vica versa), but the recipes are indeed tasty. I find paprika a fine substitute for Kashmiri chilis. I wonder if mine has the typos, Diane. It is a newer edition of it, and I have never noticed typos, but then, my way of using recipes is I look at them, get the gist of the method, and the ingredients and then go on. I don’t tend to read them carefully, unless I am reviewing them. Fernmonkey–I agree completely–for such a small cookbook, the ratio of tasty to not tasty recipes is high. I like that the collection is very eclectic, too, representing the author’s personal taste more than what people expect to taste in their local Indian restaurants. It really is a nice cookbook–I should probably review it here. Oh that looks good. I’m a big lover of Thai curries, with all their coconut goodness, but I haven’t had many South Indian curries. I am definitely making this soon. yesterday, I made a Curry Pumpkin Coconut soup w/ Masman Thai curry paste, coconut milk, and fresh apple cider. Oh My! It’s soooo good. I can’t stop eating it! I wonder if my version is a bootleg or something as the cover says “The Great Curries of India” but the inside page says “50 Great Curries of India.” – anyhow the errors bug me. I’ve marked up “Chickpea Curry” pretty handily. 9 oz. of chickpeas is hardly 1/3 cup, and cooking chickpeas for 50 minutes will not come close to being done, and directions seem vague as to whether it’s 3 or 4 onions (“with the last chopped onion”- huh?). But all in all I like it a lot and should cook from it more than I do. Plus curry ingredients are pretty flexible anyhow, so I never worry – just mark up what I actually did and leave it at that. While born in Minnesota, I grew up in Brazil and Africa. One could not go to the store and buy grated coconut. We got the real thing and it was my job to crack, drain, peel and shred the coconut. We made our own coconut cream and milk by soaking the shreds in hot milk. My mother’s curry recipe, which she developed over the years, is still a family favorite and a must on Christmas eve. 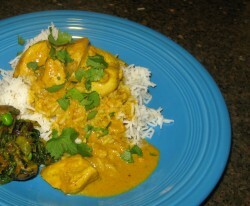 Her recipe was an Indian/African version of groundnut stew – groundnut being peanut butter – added to the curry. We still do it the old way by starting with a fresh coconut. The very best coconut milk “convenience product” I have ever seen was at a street market in Thailand. The vendor carefully washed a Rupe Goldberg-like machine for what must have been 5 minutes. Then he pushed through many pieces of coconut meat, yielding several cups of grated coconut. He set a bit of this aside, washed the machine again for a while, then put the meat through another part of the machine, yielding fresh coconut cream which went into a baggie, tied with a rubber band and handed to customer. He again washed the machine, pressed the meat again, yielding several cups of coconut milk – again with the baggie and rubber band. He then handed off the cream, milk and the leftover bit of grated coconut to the woman, who went about completing her shopping. All she had to do was buy one of the many freshly-made curry pastes available in the market, the aromatics, some meat or fish and she would have a tasty Thai curry that she could prepare in a few minutes. I WISH I had a video camera to capture it – it was amazing. I’ve tried to make coconut milk from cocnuts here in CA, but they don’t work well. I don’t know if they are a different variety, too old or what, but they yield little cream and taste thin. In a number of Tamil households, we make a spicier version of this with goat’s meat (mutton). We use ground coconut instead of coconut milk, so the texture is slightly grainy and it is spicy, but the base masala remains the same. Wishing and praying for your good health. Roxana–I adore goat meat. In fact, I almost made a goat curry for tonight, but Zak talked me into lamb. I can get frozen coconut that is nicer than the fresh coconut I get here in Ohio, so I may try the Tamil goat curry you described. I don’t cook seafood much for two reasons–good seafood is hard to get in Ohio, and when it is available, it is usually godawfully expensive. And the worst is this–I developed an allergy to shrimp, and have reacted slightly to clams, which means all shellfish is now off-limits to me. Which is sad, because crab is one of my favorite foods in all the world. I absolutely love it. Scallops were a close second with shrimp coming in third….and now, I can have none of them. At least I no longer live on the East Coast so it isn’t as torturous as it otherwise might be! get well soon ! i read about your surgery, but then my eyes fell upon the ‘coconut’ post. which true-blooded malayali can resist something that refers to coconut ! i could tell you a hundred and one ways to cook with coconut. you know that malayalis are addicted to coconut and some people, like my father, do not consider a curry as a curry unless it has coconut in it. for them, the biggest culinaty tragedy is to run out of coconuts. it equals to famine ! more on coconut later, or through my blog. meanwhile, take rest and get well soon !